B-U-T. I’m also from that teeny tiny minority that likes to watch films not for the action in the foreground but for the setting, the background, the outfits, the floor!!! I check out the photo frames hanging on the walls or the type of upholstery in a drawing room. I like to know what curtains are being used or whether they compliment the female leads’ outfit in that particular screen. 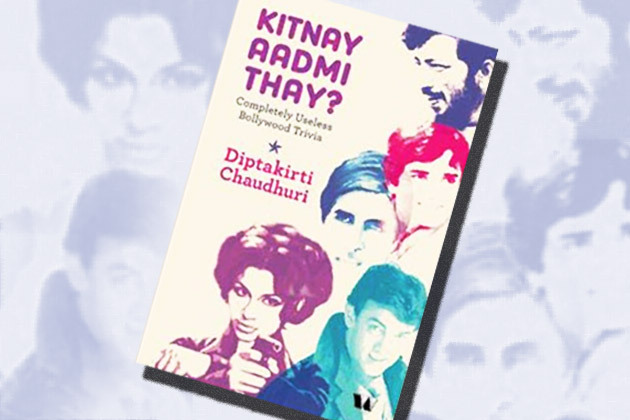 The best part about Kitnay aadmi Thay is that it isn’t really a collection of ‘trivia’. It is a collection of some of the best filmi memories, his (I have my own collection, but his collection is pretty close to mine, so no complaints 😀 ). There is no index to the book, because the best way to read it is to dive right in. Open at any page and you’ll be sure to get absorbed .The book contains sections on possibly all cliché characters (Maa, Baap, Dost, Teacher, Killer, etc..). Heck, it contains a sections for the Bollywood clichés by itself! Laugh : “…..Rani Mukherjee recited verses from Jibanananda Das – a famous Bengali poet- in her Juhu-acented Bengali and broke many hearts by dying soon afterwards. Diptakirti barely leaves any Bollywood-defining stereotypes alone! There are sections for the portrayal of Parsis, Punjabis, the South Indians and the Bengalis in Bollywood movies. There is another section for regional actors who made in big in Bollywood, and those that didn’t. Which brings us to the lists of actors who came up on their own, without filmi-backgrounds, there are star kids who made it big and those that didn’t. You can read about the influence of a myriad of fields on Bollywood. Cricket? Check.Other Sports? Check. Doctors? Check. Trains? Check.Authors? Check.Diseases? Check. locations? Check.Religions? Check. The book, in my opinion, should be relished while seated on a comfy sofa, near the window, with a cup of hot tea and the rains outside. Thats the only way to enjoy stuff that is so much a part of our childhood. The list of Amul dedications. There are many more out there, but the ones in the book are heart-warming too. Forgive me my recent absence from the blogosphere. It is not that I suffered from writer’s block or anything. The kids have been on their rampant best. Mom is in town and though I would like to spend as much time with her as possible, my visits to her were relegated to just weekend visits. The kids cooperated by promptly falling ill each weekend. Visits to the ped’s clinic took up most of my weekends. Mom, though a bit upset at the lack of time we have for her, cheered up each time we did make an appearance! Lui has been on impeccable manners recently. I’m half-suspicious someone’s taken over my daughter’s spirit 😐 !! I mean, no tantrum in ONE WHOLE WEEK!!! Am I hallucinating or what?!! Somehow, her good manners, though a relief, are a little dampening. We are too used to her spicy self most of the time 😦 . Docility doesn’t suit her at all!! She isn’t meant to be meek! I’d rather have my eye-brow waggling, nose wiggling, zillion-expressions-per-minute baby back. Thank you very much! (I would have provided links to the articles written by others, but alas, WordPress isn’t allowing me to paste anything on this tiny box into which I type this post). Anyhow, life goes on, even if me and the twins have a persistent cough that refuses to abate…no amount of home remedies, medications and soups help. I’ve stopped all medication for now. Only warm water and 3 minutes of steaming before sleeping, for the kids as well as me. Hopefully, it should bring some relief. ……..is my 3.5 years old son, Shobby!! The BIL (SIL’s husband) brought this shirt for Shobby from Dubai. 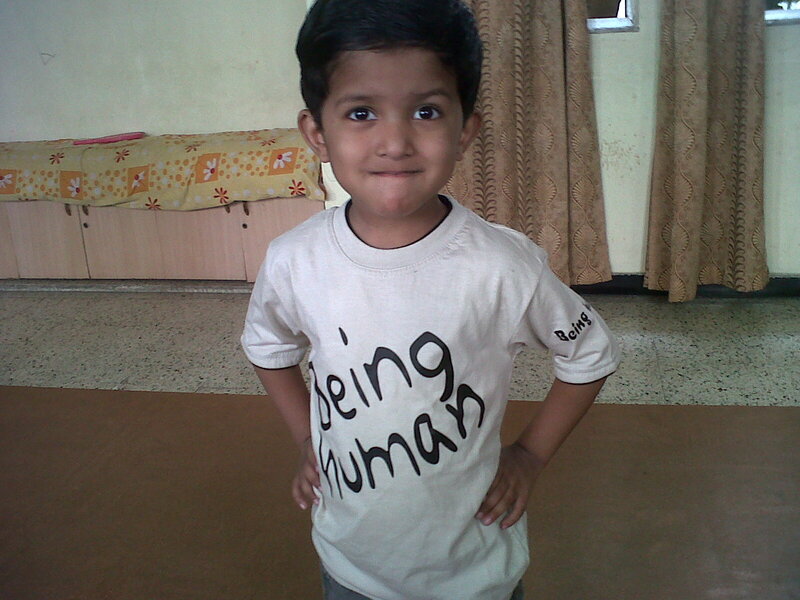 We just had to tell him once that the shirt is from Salman Khan. The little fan in him immediately donned the shirt and strutted around. I remember posting a few months back about my weight gain issues and my lack of initiative to lose any of it. Last week I posted a few pics from the cookery competition I was a part of. People commented that I looked rather slim for a mother of twins. Aaah!! But that was only half the truth. What many people DID NOT realize was that the snaps were cleverly clipped at the point where they showed the entire me ! Brilliant work, that. Especially since it came from a person who has never touched Photoshop! How long can one deceive? How far do untruths go? We all gotta wake up and smell the coffee, right? But, here comes the REAL shocker! I breached it by FIVE kgs! So, forget my laments about hovering just above the 70kgs mark on the weighing scale. I, shamefully, stand at a mammoth 75kgs for a 157cm frame. So no laments from mother, no tender hints from the BF, no straight-faced truths from the twins nor the ever-changing measurements at the tailor’s have been instrumental in making me come to terms with the weight gain!! Once more, I blatantly confess to my procrastination, my hopes of starting work-outs from ‘tomorrow’ and my resolve to give up on fried food and sweets asap. Tell me, is there a cure for the mind?? I’m sure my body follows my mind. And my mind is rather weak right now. I can’t stick to a diet, I can’t follow a work-out routine, I’m lazy, hopeless and now, irrevocably FAT. Can someone pull me out of this pool of pity? ?